You are here: Home / Affiliate Marketing / The Digital Marketing Mastermind by Anthony Morrison – Should You Join? The Digital Marketing Mastermind by Anthony Morrison – Should You Join? Who doesn’t know Anthony Morrison, right? He’s a well-known speaker, author and coach in the online marketing world. Yet, he’s also famous for creating several products in the past that don’t deliver. Some people call it scams. One of his latest programs is called The Digital Marketing Mastermind (DMM) and it is created for newbies to start their online business the right way and help existing marketers to generate more income. Entrepreneurial mindset training, well basically to mold you to think like an entrepreneur. A 30-minute video training on how to use an effective business funnel. Interview recording from industry experts who will share insights in areas like affiliate marketing, eCommerce and social media. Bonus #3 – Weekly live video training called Success Connection where Anthony shares email marketing tips and offer giveaways. Unlike other mastermind groups that cost thousands of dollars to join, Anthony has stripped down the membership fee to an affordable $7 per month. However, he did hint that the offer will not last very long and that a price hike is likely in the future. Anyways, the program comes with a 30 day money back guarantee, so it seems worth trying. Immediately after signing up, I got several welcoming emails, login details and an invoice for the order. Looks legit so far. Now, let’s see what’s going on in the course area. After logging in, I ended up on a site called Morrison Education. After browsing through, it appears that the Mastermind is part of a larger training and resource project. The last I counted, there were 19 courses (two of which are included in the membership) and 9 different software for accelerating businesses. The Mastermind course kicks off with the typical fundamental topics, teaching you the qualities of success and the importance of setting goals. All the 5 lessons can be completed in less than an hour. In the second part, Anthony will walk you through how to setup a funnel and also give one to use for free. And then there’s the Facebook group which requires you to write in in order to join and the live weekly webinars where you can register and watch replays (dated as far back as 2015). What seems to be missing however, is the interviews with the experts AND the digital book bonus that he promised. And what seems to be very obvious is that you are being promoted to buy two of his suggested tools – ClickFunnels (a funnel program that he’s affiliated with) and BuildDirect (a tracking software which he co-founded). ClickFunnel, in case you aren’t aware, is a popular marketing funnel builder, created by Russell Brunson, that can be applied to any type of online businesses. This is the system that Anthony uses for most of his business and to duplicate his method, you’ll need a ClickFunnel account too. To continue using the system after a 2 week trial, you’d need to choose between the Starter Plan ($97 per month) or the Suite Plan ($297 per month). As for the second tool, there are three plans to choose from ranging from $20 to $100 per month. And then, there’s all the other courses that claims to give insider tips, provide done-for-you monthly funnels and one-to-one coaching. All of them are priced differently – some only have a one time fee while others have recurring billings. Now, they aren’t being promoted very often, but they do show up constantly on the training dashboard as a gentle reminder for you to check out. Is It Worth Paying $7 Per Month? At the current rate, it seems that there’s very little stuff going with the Mastermind program. The only addition that’s happening is probably the live weekly webinar, which can actually be easily accessed on YouTube. That means, you don’t really need the platform to watch his training. And you are probably just paying to mingle with other members on Facebook. Yet, there are bigger questions that loomed ahead. Have you ever thought about how to use a funnel to get traffic and conversion? Even though it’s not made clear in the beginning, Anthony’s method is all about obtaining traffic using advertisement. Whether it’s through Facebook, YouTube or Google Adsense, you’ll be paying to get visitors to an optin page and then offer them specific products or services. The good thing is that, you’ll get to build an email list to be used for future promotion. The downside however is that, you definitely need to spend more than $7 per month. Using ClickFunnel, signing up for other traffic courses AND paying for advertisement itself – all of these can round up to several hundred (or thousand) dollars per month. Don’t get me wrong – ad is a good source of traffic, but it’s also costly for beginners and risky if you don’t have a good understanding about basic online marketing. With Anthony’s business method, it’s as if you are learning how to sprint even before you can run properly and we all know what kind of dire consequences that could lead to. Given his reputation in the online marketing industry, it seems that Anthony is trying to do something better (make it more trustworthy perhaps) with his new ‘education’ platform. At the very least, there’s a prompt communication about the purchase and an email for contacting support when you need it. Bad habits are hard to curb and the entire program (if you look very closely) still lurks many of the traits that he was previously known for. 1 – There are a lot of subtle upsells to make up for the lack of training integration. That means, instead of putting everything together, teachings are compartmentalized into smaller packages and sold at varying prices. Many marketing gurus use this strategy as an explicit move to make more profit and while that’s not entirely wrong, it can be cost-burdening for new and inexperienced members. 2 – One of the tagline for the Mastermind program is to help people start an online business, yet besides all the motivational talk and the funnel video training, there isn’t really any step-by-step tutorial to show how things are being done. If you think that the weekly videos can offer something helpful, well good luck with that too. 3 – In actual fact, most of the video training talk about email marketing and funnel building. Once in a while, he would reveal some income reports just to show how efficient his system was. So getting an ClickFunnel account is definitely a must, but there’s something else he teach that can be dangerous for your business. 4 – In one of the video training, Anthony talked about using solo ads. Now for those of you who don’t know, this technique involves promoting advertisements through email lists that are acquired by other web owners. For example, someone who subscribes to a health blog will suddenly receive your promotion about a weight loss product. Here’s where a few things can go wrong. That someone has never agreed to have his/her email shared with other people. Even though he/she is interested in health information, it doesn’t mean that he/she will buy a weight loss product. If you emailed too frequently, they are likely to find it obtrusive. And the biggest question – is that person’s email address even real? Solo ads work for a small number of businesses and some even swear by it. Most people use it because it could potentially yield faster results (as in sales conversion), but it’s also a shady and costly industry to step into. For newcomers, it’s certainly not the best way to do sales with an audience who have no idea who you are in the first place. 5 – Having said all that, Anthony’s training focuses a lot on paid traffic generation and there’s very little to learn in terms of free traffic. The thing with paid method is that you need to constantly invest in order to generate traffic. As with the free method, traffic is accumulated naturally and they usually last (and convert better) for a long period of time with very minimal investment. So, why doesn’t Anthony teach this method more often? Well, it simply takes more time and there’s probably less money he could make from it. Overall, I don’t think it’s worth the time joining The Digital Marketing Mastermind. The basic training is nothing to shout about and the core training is all about paid traffic generation (and other risky tactics) which I wouldn’t recommend for beginners. If you are an intermediate learner wanting to get into building funnels, take his training with a pinch of a salt. Making sales online is not about fancy sales page or using the latest funnel software – it’s more about providing values for the audience in the long term, without making them pay more than what is needed. If you can figure that out, then creating a funnel thereafter would make more sense for people to buy something from you. If you can’t, then you’d be wasting a lot of money on expensive programs. Starting an online business need not be complicated and many people thrive very well on free traffic methods and even on niches that don’t seem to be profitable at first. These are the things that marketing gurus like Anthony aren’t sharing, but you can learn more about them from my recommended training platform here. I hope that you’ve been educated by this review. If there’s anything else you want to share, feel free to leave some comments in the space below. The training info looks very scarce, unclear and doesn’t seem like it would bring any long term benefits. With so many online marketing strategies, this one can be very costly when coupled with a funneling software. May be a good program for skilled marketers, but definitely not for beginners. I saw Mr Morrison’s Digital Marketing Mastermind promo earlier today, but was skeptical because of my friend’s previous experience with product offerings from him, I wanted to be careful before diving in. After reading this review, I must say that it isn’t a unique product and with all the other purchases, I’d rather stick to the program at Wealthy Affiliate. At least I know what I am getting without any hidden purchases. Thanks for the review Cathy. One thing I did find a bit confusing is that you state the cost is $7 a month, but then mention $97 a month – is that for ClickFunnels? I have heard about Russell Brunson’s program before, but am not sure about paying out so much per month for it. Hi Grace, $97 per month (or $297, depending on the plan that you choose) is for using the Clickfunnel software. But you still have to pay $7 per month for letting DMM teach you how to use and monetize from the funnel. Hope this clears the confusion. This program doesn’t look like it would be worth joining. For starters, I think it’s somewhat misleading for them to make it sound like the program will cost $7 per month, and only when you’ve signed up for it, do you find out that you need to spend a lot more than that to put it into practice. Also, there’s the part where you’re supposed to send unsolicited emails. Not only can that potentially get you in trouble, it probably wouldn’t generate many sales, since there are so many people trying to market the same thing via email. As a subscriber to his list, I get a lot of emails from Anthony Morrison to join his Mastermind program or attend some webinars. I usually just delete the mails and haven’t given any thought about trying them yet. He seems like a sincere guy, but I don’t want to chase too many rats at the same time and catch none. Thanks for giving me an “insider” perspective of his program which serves very little value. It saves me a lot of time from having to find out myself. 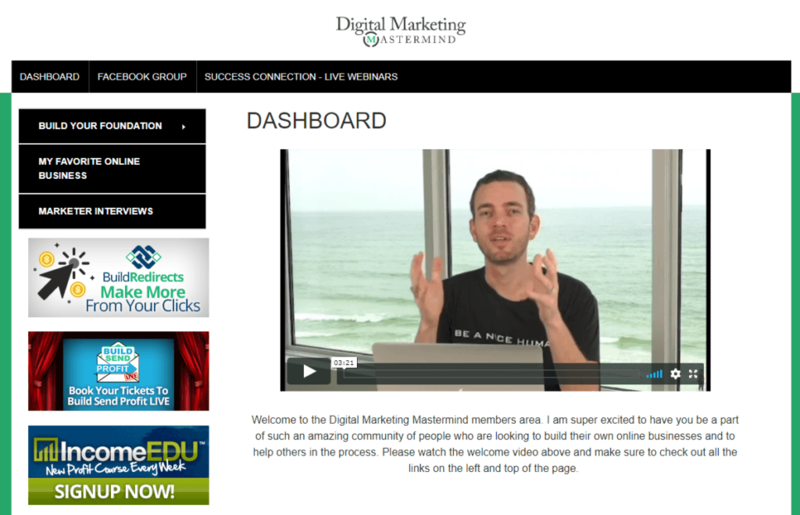 Thanks for a thorough and hands-on review of Digital Marketing Mastermind. It sounds similar to other platforms that I have had some experiences with over the years since entering the online marketing world. What they have done is to create a low-entry (cost) front end product that leads into follow-on up-sells, presented in an obtrusive and less pushy manner that will cost you a lot of money. Rather than tools that do not work, they are pushing ones that do work, but perhaps are more than what an average marketer needs. I always use the car analogy for newbies (or even intermediate level marketers) when it comes to tools. Why buy a Mercedes when a Volkswagen will do the job? The fancy car is taking money out of your pocket as a business owner. That money could be better used in other areas of the business, or for personal needs. A good thing for the industry, in my estimation! I hope this review gets seen by lots of people so they will be well-informed about this platform. Even the author/owner of Digital Marketing Mastermind could pick some points up here to improve his program. I know that this is the kind of feedback I seek as I grow my online business. Digital Marketing Mastermind does not tell a lot. I am not sure exactly what the program is all about either with that little training content. Doesn’t look like there’s a lot going on the dashboard that you’ve presented. I don’t think it’s worth investing $7/month, let alone $300 without intensive training on how to use that funnel software. That’s my opinion thought. This may be a great program, but the fact of the matter is that you need to spend more money in order to get more results. As someone who’s new in the affiliate marketing space, I much prefer to learn and get the hang of free traffic generation first before diving into something with higher risk like paid traffic. I think this approach will help me to understand my audience better.